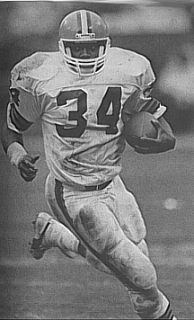 A member of the 1981 national championship team at Clemson, Mack joined the Los Angeles Express of the USFL for the spring 1984 season and rushed for 330 yards on 73 carries (4.5 avg.). Waived by the Express and taken by Cleveland in the first round of the 1984 NFL Supplemental draft, he signed with the Browns and was considered a NFL rookie when he joined the club for the 1985 season. The power-running Mack moved into the starting lineup and teamed up effectively with RB Earnest Byner. Browns went 8-8 to finish first in the AFC Central. Lost AFC Divisional playoff to Miami Dolphins (24-21). The combination of Mack and Earnest Byner that became the third NFL running back duo to each gain a thousand yards in a season in 1985 was less effective in ‘86, as both had injury problems and they only were paired together for a total of seven quarters. Mack’s shoulder injury slowed him early but he came back strong in the second half of the season and ended up rushing for 665 yards and 10 TDs. In the strike-shortened ’87 season, Mack ran for 735 yards and caught 32 passes, earning a second Pro Bowl selection as the team made it to the AFC title game for the second straight year. But injuries limited him to 11 games and 485 rushing yards in 1988 and injuries combined with a league suspension following a drug arrest held him to four games and 130 yards in ’89. Mack returned to form and was a bright spot on a 3-13 team in 1990, rushing for 702 yards and catching a career-high 42 passes for 360 more. He ran for 726 yards and caught 40 passes in ’91 but was showing clear signs of wear and, after a 543-yard season in 1992, he appeared in four games and rushed for 33 yards in 1993, his last year. Overall, Mack was considered one of the top power runners in the game, if not a particularly adept blocker, and rushed for a total of 5123 yards and 46 touchdowns with a 4.0 average per carry, along with 197 pass receptions for 1602 yards and another 8 TDs in nine seasons with the Browns.